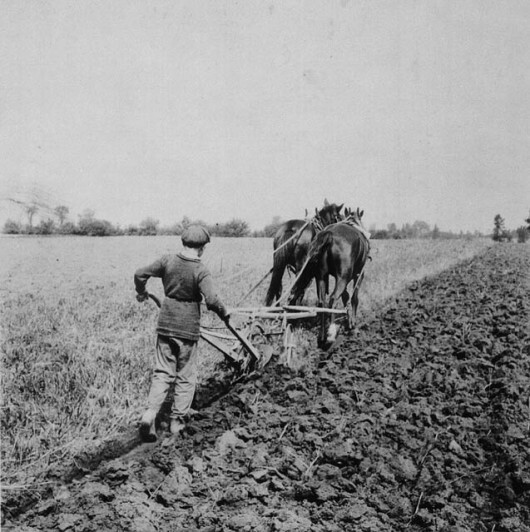 The advances in mechanisation at this time meant the agricultural labourer's income was below subsistence level - as part of the family's rent, the landowner required his wife's labour to supplement this, particularly at harvest time when labour was in short supply, and each child as they grew able, found employment hoeing long rows of turnips, gathering stones and finding jobs in domestic service. John and Ann's first child died at 6 mths. It became increasingly difficult to find employment in Wiltshire, and the decision was made to move from their birthplace to Wales where John found work in a mine providing coal for the iron works. Their first 2 sons were born at Llanvair, Abergavenny, Monmouthshire, but again John experienced worker exploitation. Publicity at the time stated "The physical condition of the Welsh seems almost if contrived for the double degradation and employer profits. Their works are surrounded by houses built by the Companies without the slightest attention to comfort, health, decency or any other consideration than that of realising the largest amount of rent from the smallest outlay. Heaps of rubbish lie about in the streets in front of houses - there is no drainage or lighting. John viewed first-hand his and his children's future - wages barely kept them fed and children as young as seven were working underground in the mine. John reviewed his future and that of his children - wages barely kept them fed. Faced with life's reality, the family returned to Easton, Wiltshire where the move permitted them to furnish the necessary documentation to make application to immigrate to New Zealand -a decision which meant they would leave behind their family and the life they knew and face an uncertain future. It is not known just when John and Ann Guilford fervently adopted the Methodism faith. Religious non-conformity began first in England but the Welsh were great chapel people and it was strong there. John Wesley had formed a sect which belonged to the Church of England but later broke away from it. Registers of dissenting congregations were deposited with the Register General after the Civil Registration Act was passed in 1836 (these can be found in the Public Register Office in London and some are held in the National Library of Wales.) Non-conformists continued to marry in the Anglican Parish Church as this was the only legal way a couple could get married until Civil Registration came in 1837. The Guilford children were baptised in an Anglican church (all birth and marriages up to 1858, requiring documentations or identification were granted or proved entirely by the Church of England). Certificates were required to prove age (John and Ann were older than most immigrants) and for their young sons and to produce these when they applied for immigration to New Zealand. No information however was gathered as to the denominations of the immigrants and no religious test was applied - the minister was required only to attest to character but not to membership of the Church. The list of preferred occupations included agricultural workers, smiths, those who worked with horses and agricultural machinery, and those engaged in the various building trades. If they were also engaged to work for an emigrant capitalist, so much the better. Men were obliged to supply testimonials as, to their qualifications, character and health; to be not less, than 15, nor more than 30; and married (with a certificate to prove it). Only if they had a large family might the age limits be lifted. To qualify for a free passage, children had to be under one year or mote than seven, otherwise they would be charged at £3. Single women might also emigrate if they had another person with whom to travel and with whom they had some family or employment relationship, and provided they too had a suitable occupation upon which they might fall back on arrival (this condition permitted John's sister Elizabeth to immigrate in 1859). If they met other requirements but did not qualify for a free passage, intending emigrants could pay at the rate of £18 15s. But like everyone else they had to be vaccinated against smallpox, find their own way to the port of embarkation and bring with them their own tools of trade, clothing, bedding and other necessaries for the voyage. 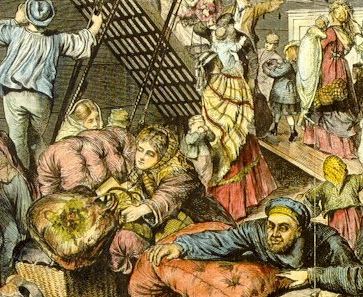 Few in the steerage reached the maximum adult allowance of half a ton of baggage or 20 cubic feet of hold space. The minimum outfit requirements were extensive, including not only the clothing which might be expected but 4 lb of marine soap per person (i.e. soap that was supposed to lather in salt water but often did not), blankets, sheets, a mattress and bolster, eating utensils and, for the women, 2 lb of starch, a pair of stays and a comprehensive sewing kit. Basic rations were supplied to a strict schedule. Three days a week, for instance, an oz of suet or a third of a pint of peas was issued to the steerage. This diet was not very varied, comprising mostly biscuit, salt meat, flour, rice and potatoes. Food was prepared by the steerage passengers themselves, who were divided into messes for the purpose. passengers themselves, who were divided into messes for the purpose. Our Guilford family, accustomed to deprivation, would have stoically accepted the difficulties they experienced during their period at sea on the 930-ton Castle Eden under Captain Timothy Thornhill. They left Gravesend full of hope and immediately, storm weather brought to all, the reality of the dangers and uncertainty of sea travel when they were forced to return and start the journey again. There were days of monotony - the 3 boys aside from some time schooling, no doubt made the most of their play; there would have been fear in the Bay of Biscay when the Eden was tossed about, leaving steerage under water and seasick passengers frantically bailing out their berths. They experienced sapping heat, unpalatable food and were battened under hatches in the gloom and dampness with seasickness prevalent. 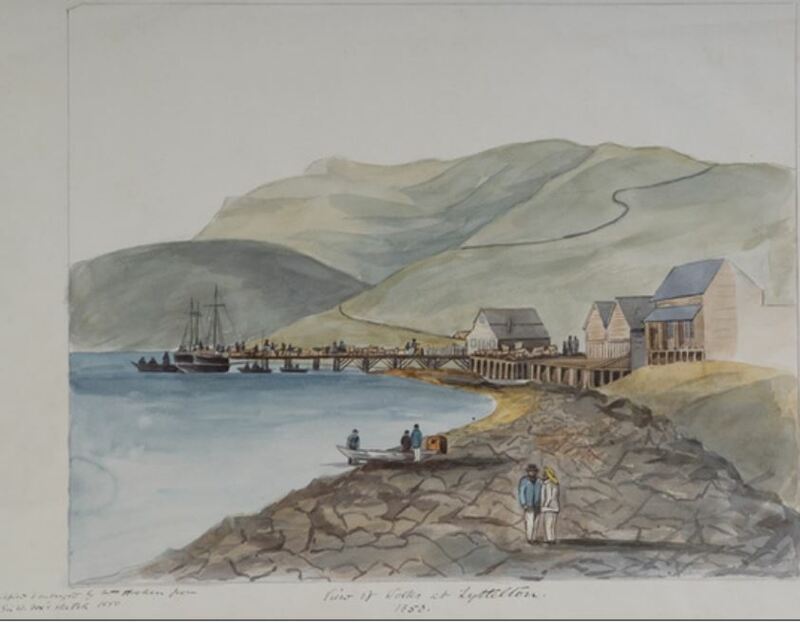 The days at Cape Town when Captain Thornhill broke the journey and brought his ship to anchor in Table Bay must have in a small re-invigorated their resolve to go on until finally they joyfully anchored at Port Victoria (Lyttelton) on 7 February. 1851 ending a voyage of 119-days. Few Castle Eden passengers would have heeded the captain's warning "that starting to pack the moment land was sighted would bring unfavourable winds" and so the last days became excruciating prolonged between reaching Banks Peninsula, and the Castle Eden finally her anchorage. Everyone would have been busy during these last hours, occupied with extra cleaning both above and below deck - holystoning, scouring and scrubbing - all would have been done with redoubled zeal and collections gathered and testimonials and subscriptions for those of the ship's officers who had earned the respect and affection of the emigrants. There would also have been special festivities to mark the safe end of the journey by using up the last of the food hoards and also there would have been apprehension that the tight web of relationships that had been built up during the time on board could be shattered by the intrusion of the world outside and there was little doubt that to see the back of some would be welcomed! On land, there also would have been as much excitement when the Castle Eden was sighted at the Heads as on board. 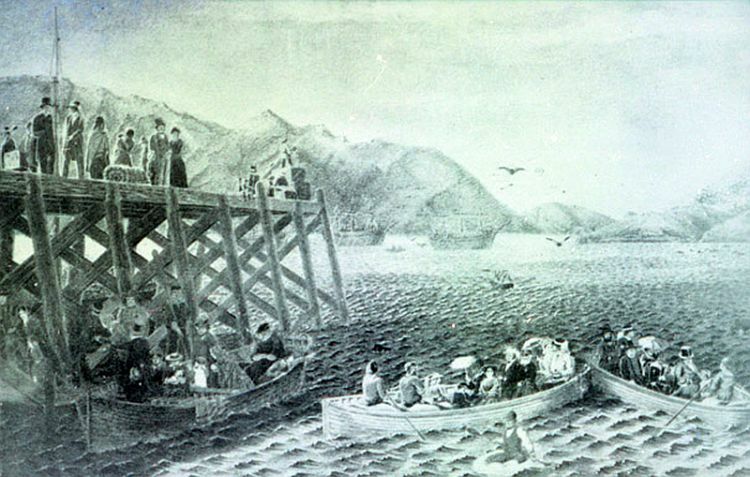 A ship meant the latest mail and news of home, fresh cargo and for some, seeing relatives, friends and new settlers. A cool morning dawned on Friday, February 7th and the day that followed was cold and overcast. About l2 o'clock, the long awaited large ship, the Castle Eden, came to anchor about 2 miles down. A strong wind was blowing from the North-east. Immediately a boat left the shore but took a long time reaching the Castle Eden where Doctor Jackson and his family were met on board by Godley and the clergy. He was said to be in the usual "landing fever" and despite the day being dismal and clouded, was said to be "in raptures with the beauty of the place". Next day was Saturday: "The morning heat was intense. A nor-wester was blowing and it felt like the breath of a fiery dragon when it blew, yet was rather less oppressive when it did not blow than when it did. Fowls, dogs and men lay gasping about, unfit for work. The thermometer stood at 96 degrees, the greatest height that it has yet reached since arrival." The following day, the Sunday, was calm and cool and it was said that " Dr Jackson preached like a Saint Paul!" On the Monday, "a cool sunny day with the harbour looking lovely" John may have gone ashore however it was likely that Ann and the boys may still have had to stay on board due to the sailor's strike. The good weather continued - "Tuesday" warm sun, cool breeze, delicious haze over everything and some passengers went ashore. Wednesday - "A very hot morning and sunny days. Wind from the sou-east" but Thursday was cooler. 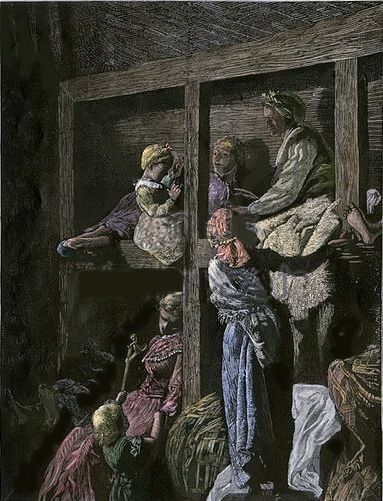 On Friday February 14th, Saint Valentines Day, at long last the strike was quelled , allowing more immigrants to be taken ashore (warm before noon and cool afternoon) Some passengers continued to sleep on board while they waited for accommodation or until they left to go over the hill to the plain so they could avoid the lack of privacy in the cramped Immigration Barracks***. Other families, glad to be on solid ground at long last, improvised shelter and lived with their families in the bracken ashore. *** The book "The Leslies" kindly sent by Mr Brian Leslie of Blenheim: Henry Leslie purchased land before leaving England, and hiss wife, widowed on arrival at Lyttelton, was given the privilege of accommodation at the Immigration Barracks for twelve weeks. *** Centennial stamps 1950 celebrated the arrival of the first 4 ships.